Ever since my pimples got worse, I started avoiding putting on makeup including foundation, powder and blush on. I apply the stuff mentioned only when really necessary such as during special occasions. However, if there is one makeup I can never avoid, that is lipstick. I apply lipstick almost every time I go out of the house except when I go out to jog. But despite that, I once banned myself from buying new lipstick because I still have a few bullets around and I want to finish those before buying new ones. Frugal girl here! However, there are times when the pull of those pretty lip colors are stronger than my desire to be frugal so more often, I give in and make me feel good about myself by wearing new (and often bright!) lip colors. My latest purchase is a testament of how much I love bright colors in matte. Presenting… the Wet n’ Wild Megalast Lipstick! 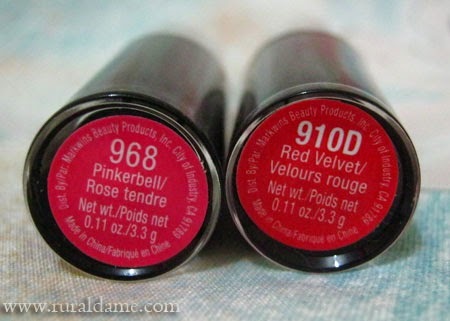 I’ve got a couple of colors (for now) namely; Red Velvet and Pinkerbell. I originally wanted to get Stoplight Red but it wasn’t available so I got the Red Velvet instead. My quest for that classic red lipstick is still on, by the way. Packaging and Appeal. The packaging is simple, it looks flimsy and cheap to be honest. While the cap is less likely to separate from the body, the plastic material it is made of looks like it can easily be broken. Scent. The scent of this lipstick is a bit off although it’s nothing I cannot tolerate. Pinkerbell - a blue-based bubblegum pink lipstick that brightens the face. It screams feminine and good enough for daily wear. Red Velvet - blue-based bright red but is not impossible to pull off for day wear (color is prettier in person). Texture. The formula is a bit creamy but not too heavy on the lips. It isn’t even difficult to apply as long as the lips are smooth and properly moisturized. They may bleed and settle into lines and like other matte lipsticks, it can be a challenge to apply the lipstick if the lips are flaking so make sure to exfoliate prior to application. Lip liner can help prevent bleeding and using a lip brush ensures precise application. Staying Power. The lipstick can stay for up to hours without eating or drinking. Otherwise, it fades evenly unlike the Nyx Matte Lipstick which fades into uneven color after eating. Price. I got this for Php 220 from a friend who sells US brands makeup. Of course it is cheaper in US stores yet more expensive in local malls. For its price, I believe this product is worth it. Availability. Sadly, this lipstick and the brand in general is not widely available in country. You either have to go to the country’s capital or buy online. Yes, I still want to get Stoplight Red and many other pretty colors. I just have to use at least 50% of what I already have for that guilt-free purchase. Bright and bold lipstick shades are lovelier when they’re matte. 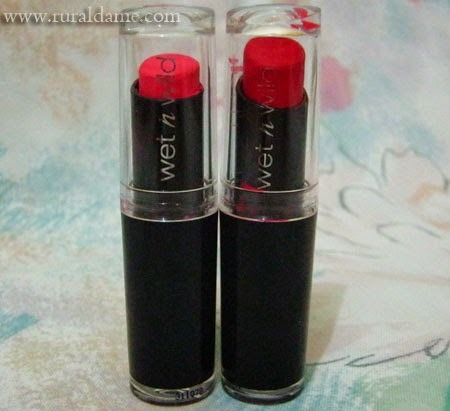 Wet n’ Wild Megalast lipstick is the answer to every frugal girl’s matte lipstick craving. They are available in various colors, long-lasting, fades evenly and most of all, they’re cheap.